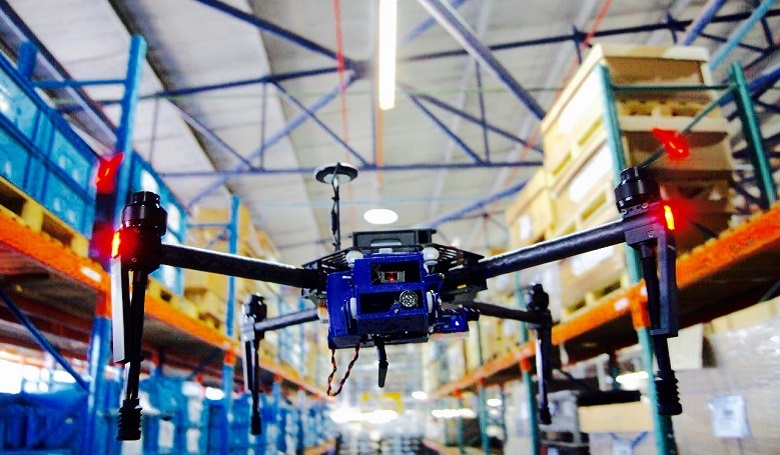 South African startup DroneScan, which has developed drones capable of scanning barcodes in high warehouses, is to run a pilot with a European customer in May as it gears up for a full commercial launch. Initially founded in 2013, DroneScan has developed a scanning product that is light enough to attach to a commercial drone and scan product inventory in large uniform warehouses using a variety of techniques. The DroneScan product includes communication with a base station for warehouse systems integration, while it also has indoor navigation which uses warehouse metrics to guide the drone in spaces where GPS is not available. Using a drone to scan barcodes in high warehouses can save hundreds of man-hours during stock-take or physical inventory, with the drone flying up to the high shelves and scanning the barcodes on each item. Sensors on the drone provide information to the on-board flight controller to keep it at the correct height to scan the rack and pallet item barcodes in the warehouse, while a server uses a database to process the scanned barcodes and send commands to the drone, while building up a list of items scanned in the inventory. Co-founder Craig Leppan told Disrupt Africa the product and concept is currently in patent, but has been selected by a partner for evaluation and trials during 2016. He said the startup has identified a serious business problem that had been acknowledged by all potential customers it had spoken to. “Scanning Inventory in large warehouses is slow, costly and inefficient, and is frequently only done monthly due to the time taken and the disruption to business operations,” he said. DroneScan funded by the business built by fellow co-founder Jasper Pons over the last 20 years, ScanMan, which provides warehouse scanning and technology. Leppan and another co-founder, Guy Hamlin, have also invested in the business alongside other private investors. The startup is also going through a due diligence process with a large VC fund, and hopes to close its round in June. Leppan said any investment funds would be used to develop a three-year technology roadmap and take the product international. DroneScan hopes to have coverage in the United States (US) and Europe over the next few years, licensing its technology to end customers and partners. “We have seen incredible interest from a number of international players in what we are doing,” he said.